Bad guys, beware! Evil aliens, run for your lives! Axe Cop is here, and he's going to chop your head off! We live in a strange world, and our strange problems call for strange heroes. 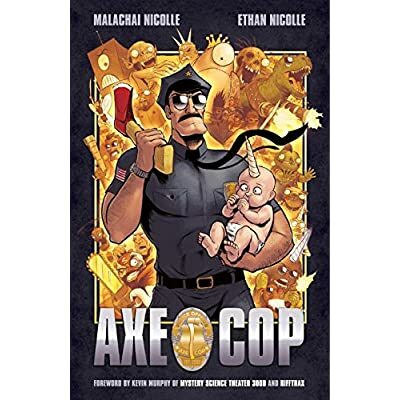 That's why Axe Cop&mdash;along with his partner Flute Cop and their pet T. rex Wexter&mdash;is holding tryouts to build the greatest team of heroes ever assembled.Created by five-year-old Malachai Nicolle and illustrated by his older brother, the cartoonist Ethan Nicolle, Axe Cop Volume 1 collects the entire original run of the hit webcomic that has captured the world's attention with its insanely imaginative adventures. Whether he's fighting gun-toting dinosaurs, teaming up with Ninja Moon Warriors, or answering readers' questions via his insightful advice column, "Ask Axe Cop," the adventures of Axe Cop and his incomparable team of crime fighters will delight and perplex even the most stoic of readers.• Axe Cop debuted in January 2010 to glowing reviews from Entertainment Weekly, Wired, and dozens of other newspapers and magazines.• Comics website Newsarama said, "Axe Cop wins the award for best comic ever!"